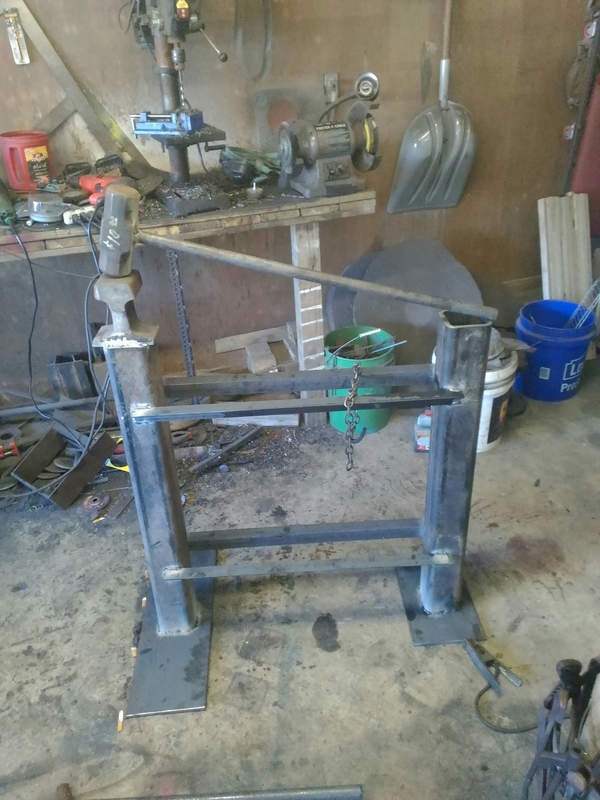 I just wanted to share a few steps I’ve completed on the new treadle hammer..still have some to go, but I think its looking good so far..
Part of what Maria and I do to try to make our foot print smaller is to make a lot of what we need instead of buying it. 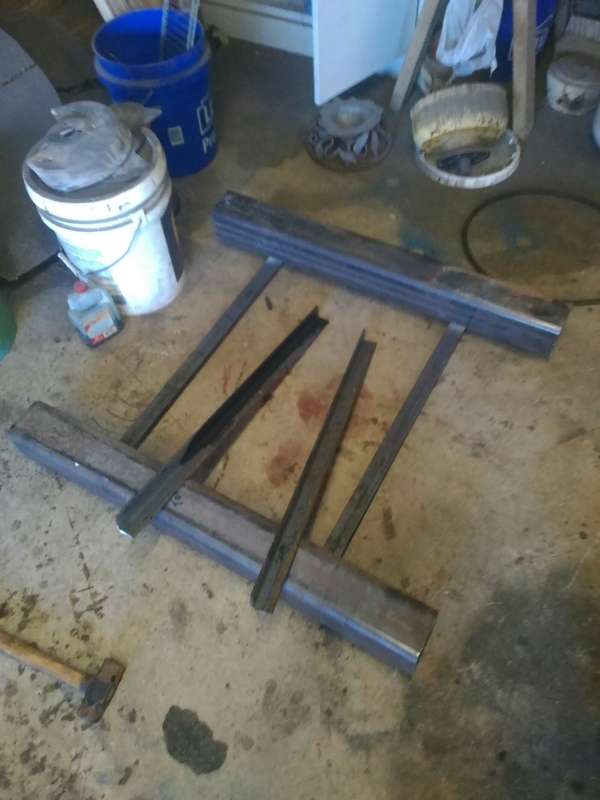 I have a tendency to be little bit of a perfectionist when I’m making tools for others, but for myself they must work well but its ok if they are uglier than a mud fence. And they usually are. 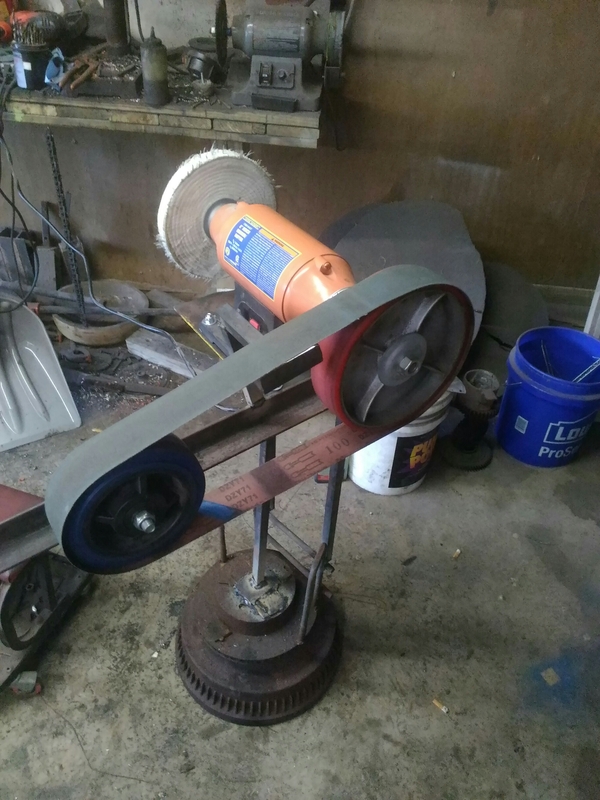 This is my home made belt grinder. Ugly? Absolutely!! But, its sturdy as a rock and runs like a dream. Rather than spend several hundred dollars for a belt grinder, I would rather build one. 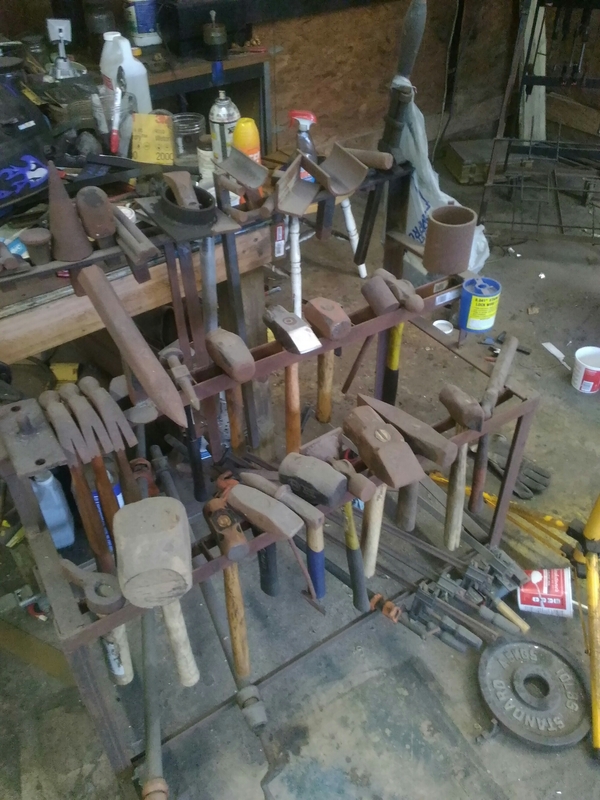 I have built a lot of my own tools and racks. We really enjoy the process of making things and the joy of using the things we make. Feel free to comment and tell us all about what you make, either to use or sell. Also, if you have anything special that you would like to have but just can’t seem to find it anywhere, let us know. We just might be able to make it for you! First day on the farm! Yesterday was the first day to work on the farm. We only planned on staying over one night and working two days. We had some success and some set back. I knew it was going to get rough. So, this is the entrance to our new land. Can you see the driveway? It’s plain as day! Right there between those two small pine trees on the left, right through that tall dry patch of grass. Got it? Nope….there isn’t one but there soon will be. We started with the badass weedeater. That think is a beast. We were able to get about 300 feet cut and then we ran into a snag. There is a ditch that runs from left to right. It starts fairly shallow, but as it runs to the right, toward the creek it gets pretty damned deep and sharp. The original plan for the driveway wasn’t going to work as originally planned. 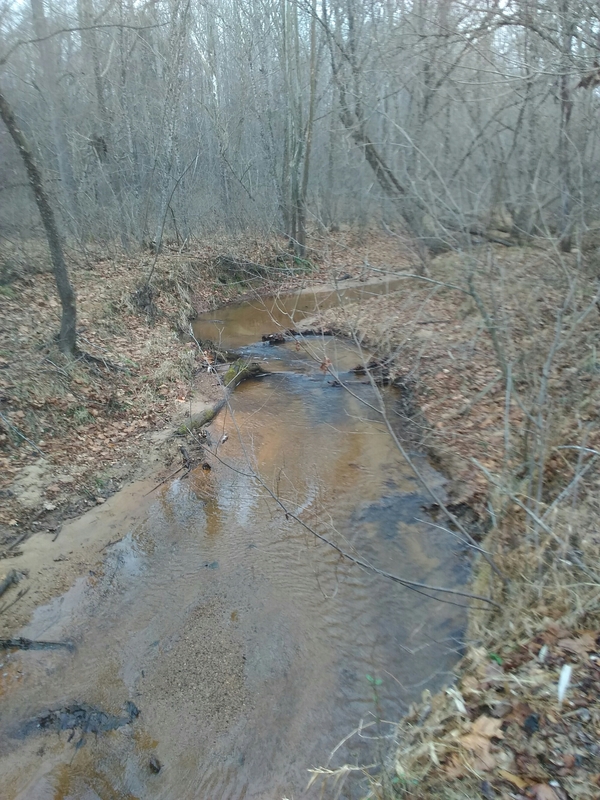 It looks to be an old natural ditch that hasn’t seen the flow of water for a long time. We will only need to fill just a bit where its shallow to create the driveway.I don’t want to fill the whole thing is because it runs to the creek and if we end up getting some crazy storm in the future, I want the water to have someplace to go besides through the house or barn. That’s the first camp set up. Obviously its temporary but it’s a start. 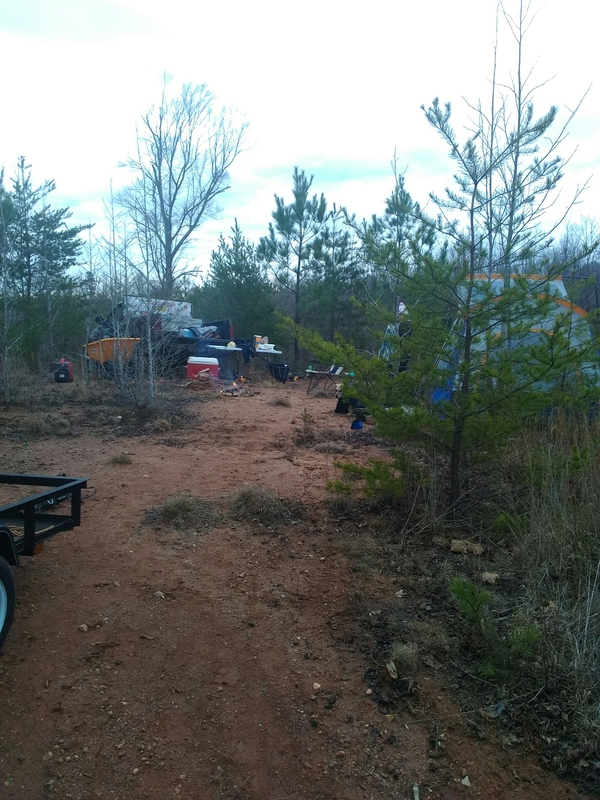 We we will keep working into the brush to get to the actual homesite, it’s only 1 ditch and 800 feet away! Such a happy team! Our head of security (Fletcher) was so wound up to be there that we nearly had to sedate him,lol. We were able to cut a walking trail to the creek that cuts a cross our parcel. It is a winding, meandering trail that got us there. It will also give me the opportunity to attack the really thick brush from both sides to get the homesite and driveway cleared. It really is a beautiful creek. I got some game cameras set up to find out what’s moving around out there. While cutting the trail I saw some HUGE deer tracks. So, for now we had to go back to the beach, but we shall return to our future home! Well, all of the paperwork is complete. We now own our beautiful 18.38 acres. One of our big struggles will be to find time to drive the 3.5 hours to the farm to work and prep it for when we can move there full time. I originally thought that we would have to wait until next weekend to start working on it as that’s when Maria and I would both have time off. But as luck would have it, I can take tomorrow off and Maria has Monday off for the holiday. So we are headed up first thing tomorrow morning and we will have two full days to work. Can I just say that I’m so excited that I can’t stand it? The first order of business that everything else is dependent on is getting the driveway cut through the brush to the homesite. Depending on the parcel and the terrain this might be a big or small job for some folks. For us, its fairly big. We’ve got to cut a 1000 foot driveway through some pretty heavy brush and briars. I went on Thursday and got a really nice commercial grade Stihl weed whacker with the metal saw blade. We wish that we could be there full time with some livestock to clear the brush, but that’s not the case, yet. Tomorrow is technically day 1 of the physical journey of homesteading for us. Wish us luck, and please feel free to leave any comment you like. Even if you want to let us know that we are out of our minds. Our next post will be from the farm with lots of pictures! Just a quick update on the smithing.. 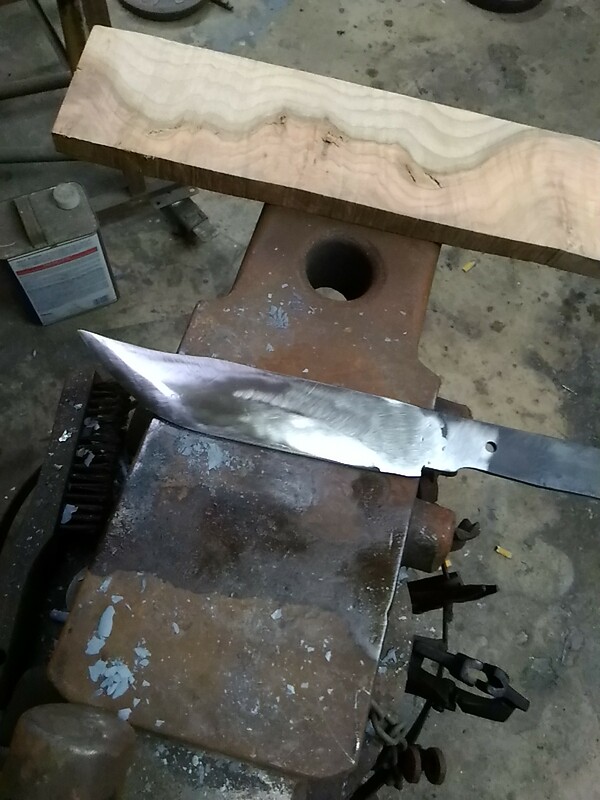 I just wanted to share a quick update on the knife I was working on yesterday. Like I said, I decided to make some “chainsaw Damascus”. 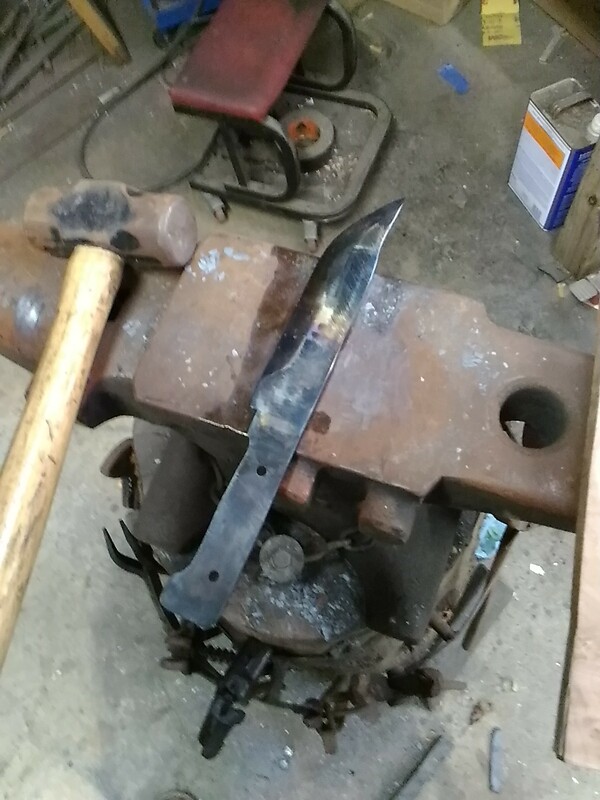 For any blacksmiths out there that haven’t ever made their own Damascus steel, be careful! Once you start you can’t stop!!!!!! The patterns that come out of it are always a surprise after the acid soak. Not only does it create a beautiful knife, but it helps to increase the strength and edge holding ability of the blade. Most times I use some 15n20 and some 1095 high carbon steel to make the billets. But I also like to use some various scrap to help lower our foot print and to try to recycle when I can. This one was made from some old, bent chainsaw chains. I’ve got a bunch that have been worn out over the years and I always thought about what I could do with them instead of just throwing them away. So, I cut them up into 6 inch pieces, tacked them together, heated them in the forge, and then pounded the snot out of them. 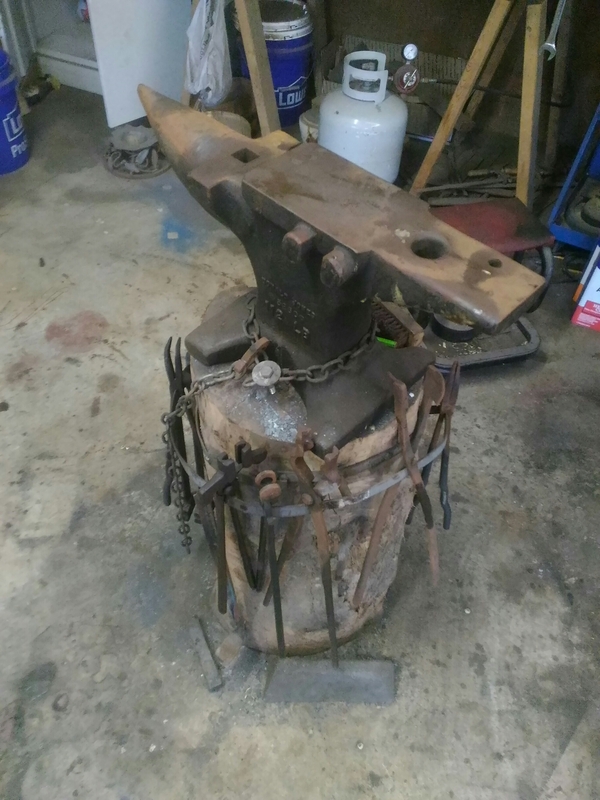 The most challenging part was the initial forge welds. 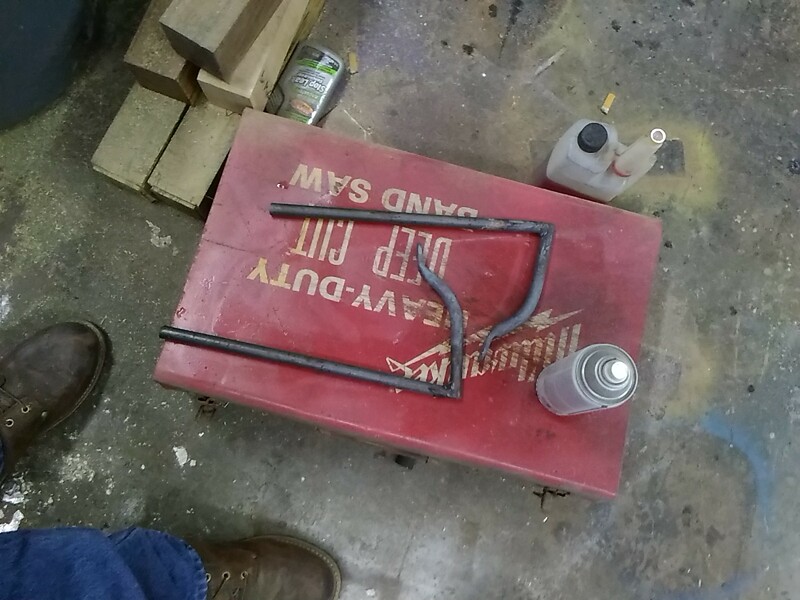 Even though I tack welded them together, it was still like trying to hit a live snake with a hammer until I got them to weld. Good times. 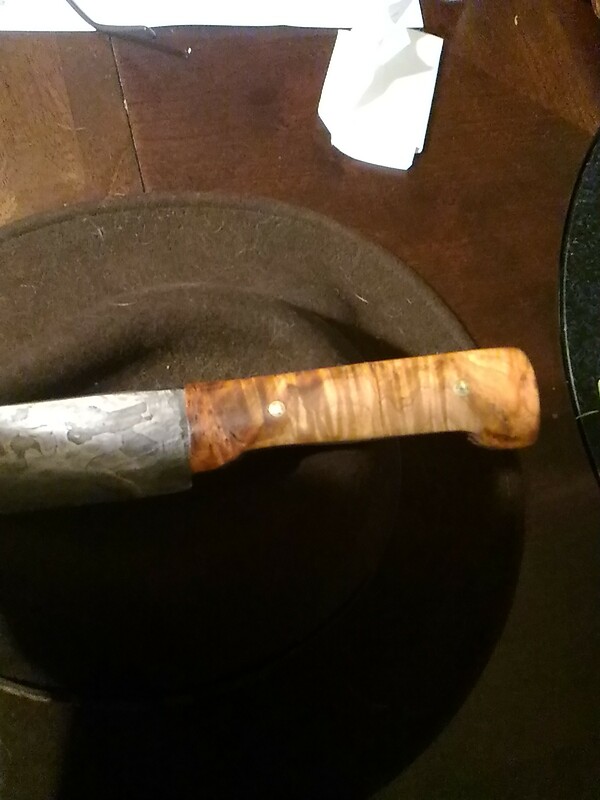 First heat treat for hardness..
And finally, after the acid etch, and the fit and finish of the handle..speaking of the handle…..
Is that not a gorgeous maple burl??? I’m really proud of how this one came out. Thanks for reading, I’ve got to keep busy until we can get up to the farm and I’ve got plenty to do. Please feel free to leave a comment, we love to hear from folks reading our blog. A little smithing while waiting for the snow..
We are supposedly in the path of the most cataclysmic snow storm ever seen by mankind. Just kidding, we might get a dusting of snow tomorrow, but if you watch people here on the NC coast you would think that the end of days is near. Maria and I actually have this weekend off, and COULD go up to our new farm, but we don’t want to brave the other outstanding snow drivers to get there. 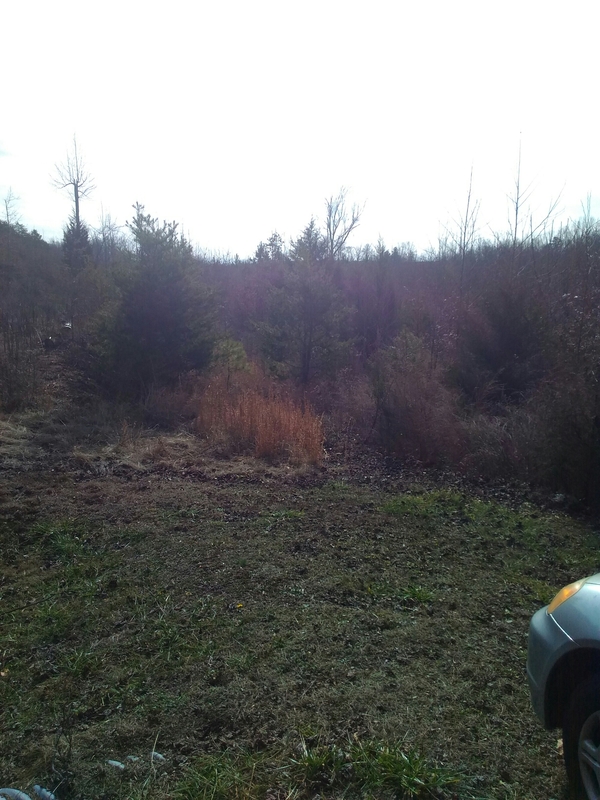 We got the e-mail and phone call earlier today that the attorneys have finished up the closing and have everything filed, so THE FARM IS OURS!!!!! Now, if we’d known that earlier in the week we could have gotten north before the snow. Our 18.38 acres are a little rough and we need to clear a lot of briars and we’ll have to stay in a tent when we go up to stay but its ok as we don’t mind sleeping in a tent in the snow. Since we couldn’t make it this weekend, we decided to use this time to work on some items for our Etsy shop. Maria has been working on an order for some cloth napkins, and I’ve got two pending orders. One is for a bearded axe I made awhile back, the other is for a set of holdfasts. If you do any woodworking or blacksmithing and you’re not using holdfasts, you are really missing out! 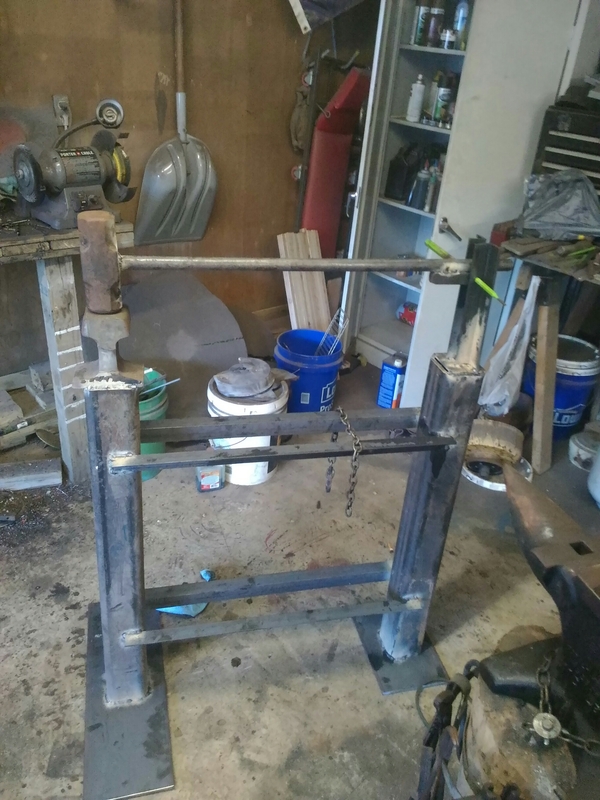 They are the old fashioned version of a bench vise. They hold way better than any vise I’ve used. These have been a pretty good seller this year in our online shop. It’s good to see folks going back to the old ways of doing things. 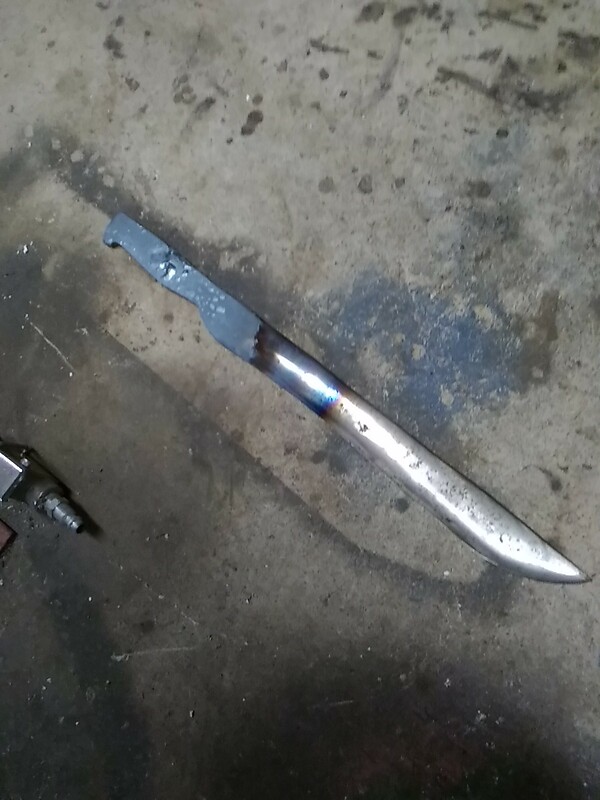 I also worked on a new machete / brush knife I made from some coil spring out of an old ford truck. 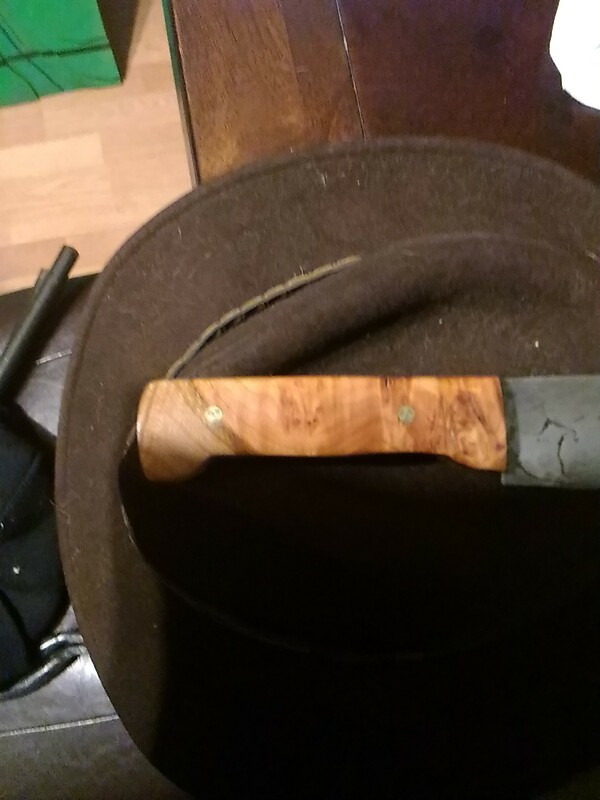 I had to pull some hardness out of the handle so I can drill it for handle pins. I’m trying to get a few more hunting knives made so I can get them posted for sale. 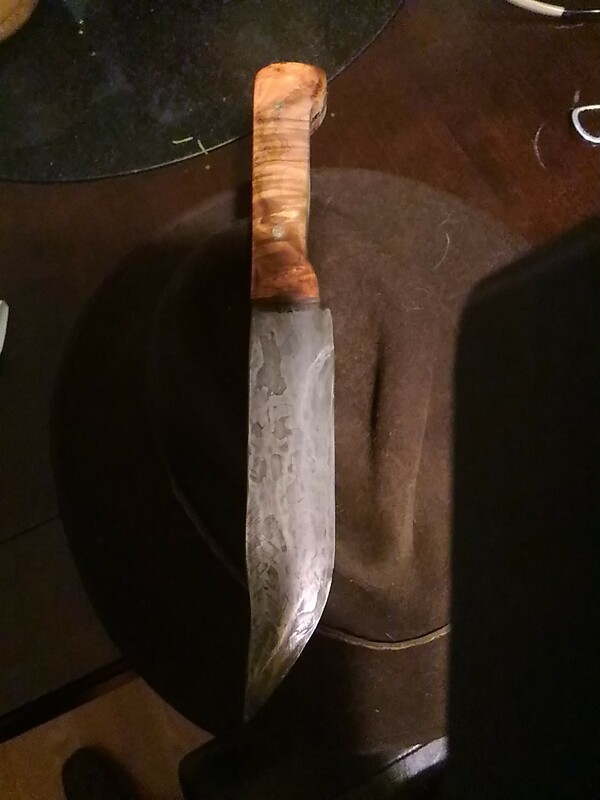 In the last couple of years I’ve really gotten into making Damascus steel (pattern welded) knives. It takes a lot longer to make, but they make better quality knife and look really cool. I think its ok if your tools look nice as well as work well. The cool thing about making Damascus is that once you get it polished up you can’t see the pattern until you soak the steel in acid to allow the different steels to react differently. That’s a whole other post though. This is one I’m working on just after the first heat treat. You can just see the pattern (barely). That piece of maple burl sitting with it will be for the handle. That will make it beautiful and functional. This post has really gotten long enough. I can get a little wordy when I start talking about my smithing. 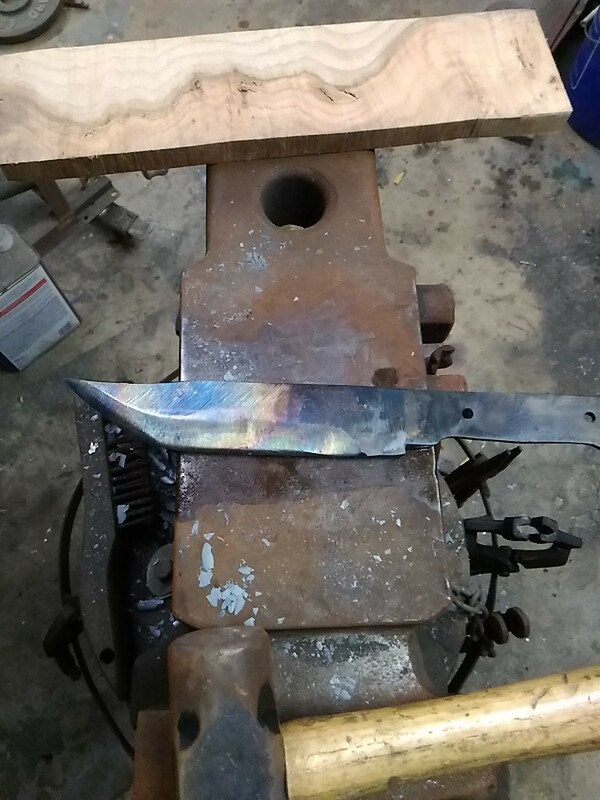 I will post some photos of the finished knife when I get it done. That steel is made from old chainsaw chains so the pattern should look really cool. Do you have some winter crafts that you like to do? 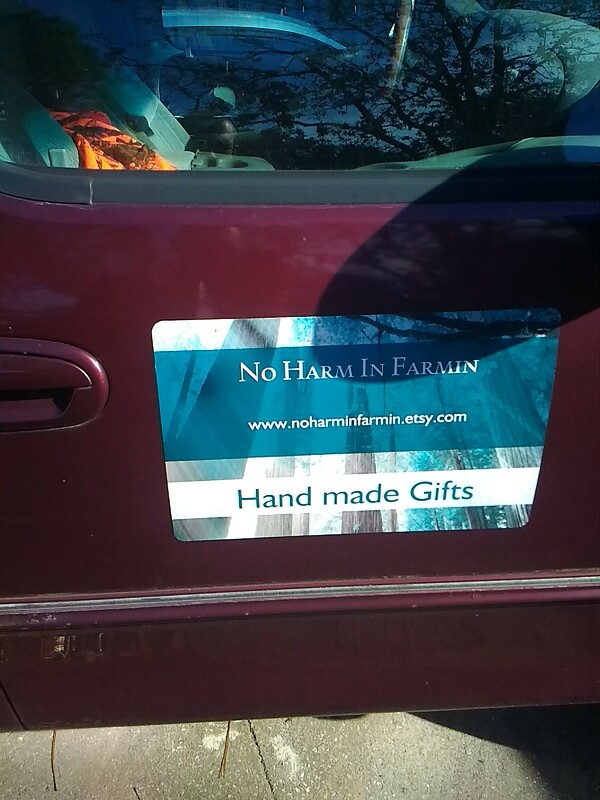 Or possibly have a shop on Etsy? If so, we’d love to hear from you about either or both. Yesterday, mid afternoon I had a long conversation with my Dad. We were discussing the up coming plans for the farm. Now let me say this, he is a wonderful person, a very loving father, super smart, but very conservative when it comes to big life changes. As we talked about different plans that Maria and I have for the farm and in what order we were planning on doing things, it really boiled down to livability. He stated that as long as you had somewhere dry and warm to lay your head, some sort of privy or septic, a clean water source….well then it can be livable. That really got me to thinking. What exactly is THE definition of livable? And if there really is a standard answer to that question. 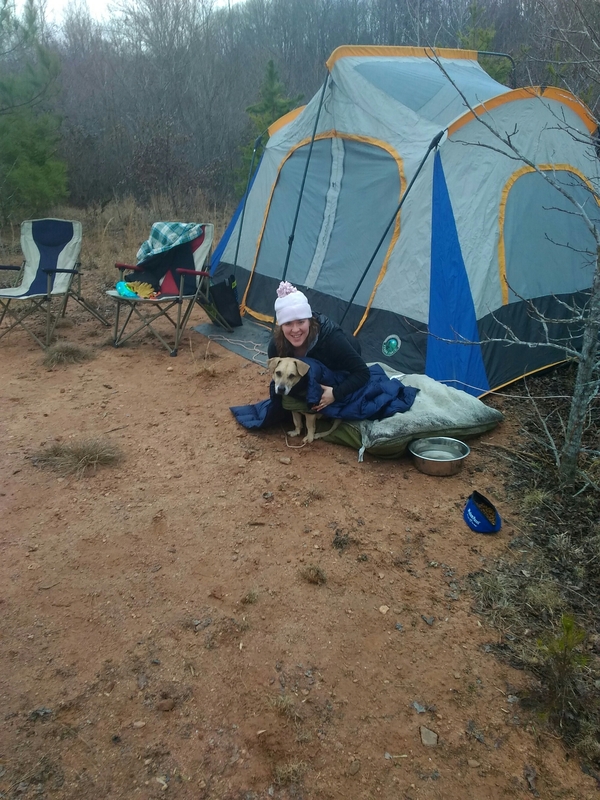 I was nearly a feral child growing up, and spent just about more time in the woods sleeping in shallow hollowed out spots than at home, so my standard for livability is probably a whole lot lower than other folks. My lovely Maria is pretty hardy, but would probably require just a few more amenities than I do. My Dad also brought up “going Amish” as he lives in northern Indiana where it is ripe with Amishmen. I told him that with the generator, and some other equipment, we weren’t planning on going “full Amish”. But that was a possibility. It was a little surprising to me that he brought up the fact that it doesn’t take a lot to make a homestead livable. This entire journey up until this point has caused me to really do some soul searching and reflecting on life. What’s your definition of livable? Could you live in a 250 sq ft cabin, or do you require a 2000 sq ft house with air conditioning? Do you require a full time supply of electricity or can you operate off of an occasional generator run? After thinking long and hard about it, I think we can operate (but will probable add the full grid power) off of a generator. For our business, an occasional power tool, or sewing machine, and to charge the phones and tablets for our online sales is really all we NEED. Let us know what you feel your needs are. P.s. there is no wrong answer, lol.